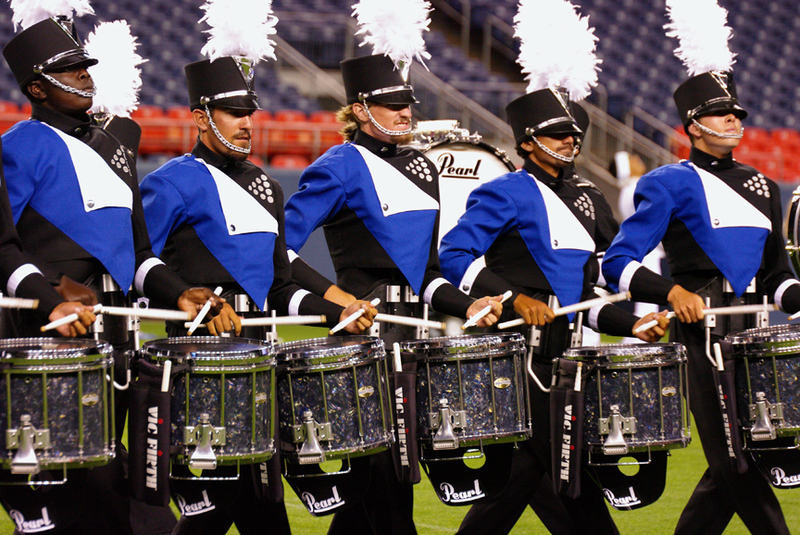 Founded by local television stars Fred and Fae Taylor in 1958, the Blue Knights have come from humble beginnings to become one of the most respected, innovative, and successful competitive drum and bugle corps in the world. After successful appearances in the East at nightclubs, the Palace Theater, and The Ed Sullivan Show, Fred and Fae moved to Denver in 1951 for stage work at nightclubs. 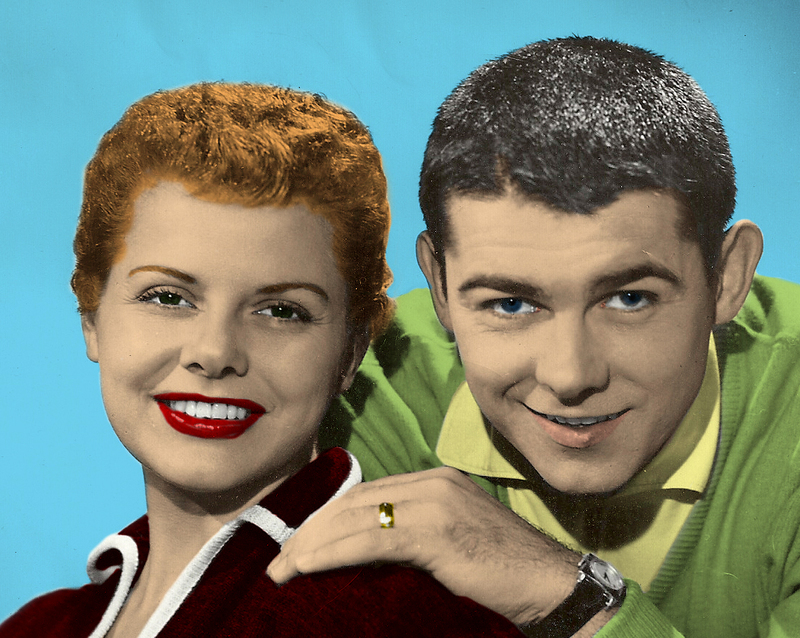 In 1953, the Taylors started Soda Shop, a show geared towards teenagers on Channel 2. In 1955, they moved to Channel 9 to have a younger children’s show, Clubhouse Gang. Being from the East Coast where drum and bugle corps were plentiful, Fred maintained an interest in the activity and joined The American Legion Grenadiers Senior Corps. In 1957, the couple opened the very popular Fred and Fae Talent School, as well as starting work on The Fred and Fae Show, which ran on Channel 7 for the next ten years. Fred and Fae retired from full time show business in 1967. As a drum instructor, Fred had drum students coming up from their talent school with no outlet to use what they had learned. Fred had the idea of forming a junior drum and bugle corps. In 1958, the Blue Knights Drum & Bugle Corps was incorporated with Fred Taylor, George Young, and Ray Route as directors of the new non-profit organization. Each member of the drum section owned his own snare drum and Fred provided a bass drum and cymbals. A very small bugle section, directed by George, worked out on borrowed brass bugles. Uniforms were makeshift, appearances scattered, but enthusiasm and loyalty was contagious. A Parents’ Auxiliary was formed and through the efforts of this group the blue uniform with white accessories was established and an emblem was designed. The young Blue Knights, in addition to their many parade appearances around the Denver area, began competing in their inaugural year. The drum corps, now affiliated with American Legion Post 178, raised sufficient funds to attend the 1959 American Legion National Championships in Minneapolis, placing 23rd out of 24 competitors. Undeterred, the corps returned to the American Legion Nationals in 1961, this time held in Denver, to place 9th. 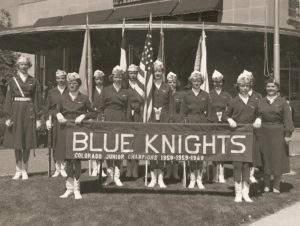 The Blue Knights quickly grew in size and ability, and in 1963 they took their only trip to the VFW Nationals, held in Seattle, hoping to stake claim to national attention. In addition to placing 10th in their debut at the prestigious competition, the Blue Knights won the separate color guard championships, besting the likes of the powerhouse Cavaliers and Troopers. This first taste of national success would encourage and exhilarate the young group. Throughout the 1960s and 1970s, the Blue Knights competed regionally in the Great Plains Drum and Bugle Corps Association. Touring alongside the Argonne Rebels, Sky Ryders, Silver Sabres, and the world famous Troopers, the corps got its first consistent series of contests. While competitive success wasn’t easily found, the Blue Knights remained entertaining and stable, and the experiences of touring throughout Wyoming, Kansas, and Oklahoma proved to invaluable to the marching members. After Ray Route’s retirement in 1972, the organization faced a thirteen year span of relative instability. Between 1973 and 1985, the Blue Knights had eight directors, the longest tenured being Richard Wentland, Sr. (1974-1976) and Gary Johnson (1979-1981). The Blue Knights made their first DCI appearance at the 1975 Championships in Philadelphia, placing 11th in A Class. 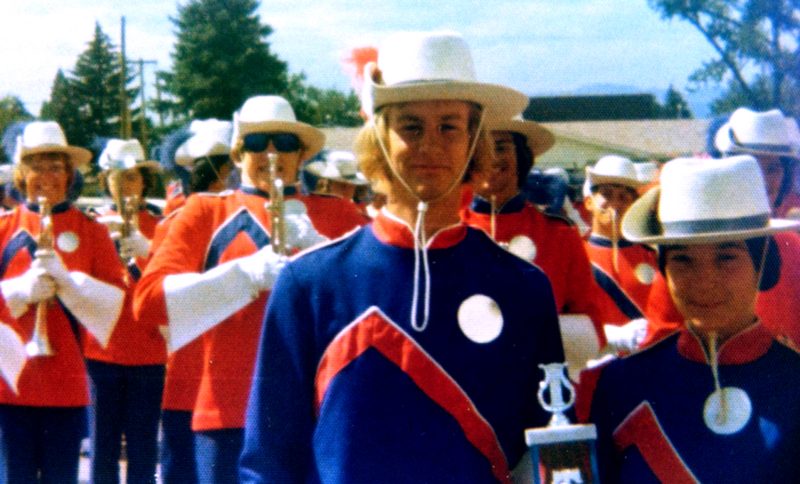 Two years later, at the first DCI Championships hosted in Denver, the corps made their Open Class debut, placing 41st at the old Mile High Stadium. 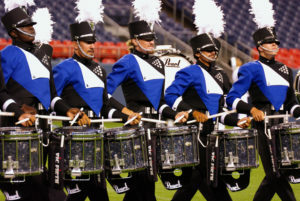 The Blue Knights began regular attendance of the DCI World Championships in 1983, qualifying for DCI membership status 1984 under the direction of George Lindstrom. 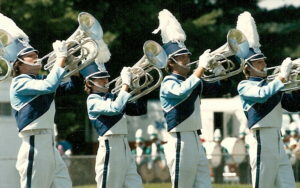 In 1984, the Blue Knights finished as a semi-finalist for the first-time ever. In the middle of the 1985 tour, amid show design difficulties and internal turmoil, Mark Arnold was hired to stabilize the corps and get the organization on the path to success. He took over for the second half of the tour, and remains the director today. During a rehearsal in 1986, the corps’ practice field was struck by lightning, sending over a dozen members to the hospital, two of which were admitted overnight. Overcoming the obstacle, the corps went on to finish 27th place, four places higher than the previous season. Despite this period of transition, the Blue Knights weathered the storm, both figuratively and literally, and began a journey that would take them to new levels of success and organizational stability. From 1986 to 1991, after reforming the board of directors and streamlining business operations, the corps improved each year both in score and placement, regaining DCI membership and making their first semifinals appearance in 1984 and again in 1987 through 1990. In 1990, after narrowly missing finals in with a heartbreaking drop from 12th place in Quarterfinals to a 13th place finish in Semifinals, the corps would sing “I Go On”, a selection from that year’s production featuring Bernstein’s Mass. “I Go On”, a song about continuing forward despite tough times and obstacles, would later become the official corps song, and is sung by the corps before every performance that the Blue Knights have. True to the new corps song, the corps forged ahead the following year, capping off its ascent with the Blue Knights’ first Finals appearance in 1991, cementing their place as an elite drum and bugle corps and earning the respect of a worldwide audience. That was also the year of the DOTS uniform designed by David Lacy, a Blue Knight alum. The DOTS uniform featured a modern traditional military look inspired by the United States Air Force Academy ceremonial uniform. The pants were light grey with a white stripe and the jackets were dark navy blue with a unique 21 white button triangle formation on the front, 3 white buttons on each cuff and 2 white buttons on the collar. 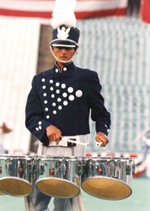 Throughout the rest of 1990s, the Blue Knights established themselves as a perennial finalist and as one of the most innovative ensembles in the activity. Slipping out of finals only once from 1991-2000, the corps played a variety of symphonic, classical, and wind literature. High profile show designers, including Ralph Hardimon, Jim Prime, Jr., and George Zingali, helped the organization reach previously unrealized heights competitively. Achieving their highest placement ever in 2000, the 6th placed corps looked primed to push itself into the upper echelons of the activity with a unique style and a distinct identity. Despite the overall strength of the organization and the excellent talent of the corps, the show design missed the mark, plunging the corps to a 14th place finish in 2001, their lowest ranking since the 1989 season. After consecutive 13th place finishes in 2002 and 2003, the corps rebounded into DCI Finals at the 2004 World Championships in front of a hometown crowd at INVESCO Field at Mile High. The corps has stayed in DCI Finals since, working their way up to a 7th place finish in 2016. Even with the success that the Blue Knights organization has achieved, the focus has remained on the growth and enrichment of youth. The corps song, “I Go On”, is an important tradition for its members. The song’s lyrics convey the ideal to live by: how one succeeds is not nearly as important as how one faces and overcomes challenges and adversity in drum corps and in life. The Blue Knights continue to strive for performance excellence, but the greater goal is to remain true to the ideals of Fred and Fae Taylor who started the Blue Knights for the purpose of giving young people an outlet to express themselves and gain self-esteem through music and performance. With a renewed commitment to artistic expression and challenging repertoires, the Blue Knights Drum & Bugle Corps has reestablished itself as a force within the activity, and the future looks quite bright. 1972 – 1975 Richard Wentland, Sr.
Have something to contribute to our history? Email us at info@ascendperformingarts.org. Learn how you can be a part of the 2018 Blue Knights Alumni Corps performance and celebration. The Blue Knights Alumni Association is standing up a committee to determine the interest level of alumni in putting together a reunion performance at the 2018 Drums Along the Rockies.